​Mark Nepo moved and inspired millions of people with his #1 New York Times bestseller The Book of Awakening, a spiritual day book. Now, in this new exploration of the human journey, Nepo inquires into the endless ways life asks us to listen. Having experienced hearing loss, Nepo affirms that listening is one of the most mysterious, luminous, and challenging art forms: “Whatever difficulty you face, there are time-tried ways you can listen your way through. Because listening is the doorway to everything that matters.” Weaving together memoir and meditation exercises, Nepo offers many ways to listen to life and live more fully. A moving exploration of self, our relationship to others, and the world around us, this remarkable guide unpacks the many ways we are called to redefine ourselves and to name what is meaningful as we face life’s challenges. ​Chimamanda is a BRILLIANT writer with a really fresh style. Dear Ijeawele is her newest book which I have not yet read but if it is anything like Americanah I'm going to LOVE it! I hope you do too! Prepare to have your world ROCKED. This book is mind opening and thoughtful. You will be hearing about this in upcoming parties, I guaranteed it! Your emotions contain brilliant information. When you learn to welcome them as your allies, they can reveal creative solutions to any situation. For 35 years, empathic counselor and researcher Karla McLaren has developed a set of practical tools for the real-world stresses of family, career, and the quest for personal fulfillment. In The Language of Emotions, she presents her breakthrough teachings for a new and empowering relationship with your feeling states. Your emotions—especially the dark and dishonored ones—hold a tremendous amount of energy. We’ve all seen what happens when we repress or blindly express them. However, there is a powerful alternative. In The Language of Emotions, you’ll learn to meet your emotions and engage with them to safely move toward resolution and equilibrium. Through experiential exercises covering a full spectrum of feelings from anger, fear, and shame to jealousy, grief, joy, and more, you will discover how to work with your own and others’ emotions with fluency and expertise. ​Love Warrior is a gorgeous and inspiring account of how we are born to be warriors: strong, powerful, and brave; able to confront the pain and claim the love that exists for us all. This chronicle of a beautiful, brutal journey speaks to anyone who yearns for deeper, truer relationships and a more abundant, authentic life. ​Glennon Doyle Melton’s hilarious and poignant reflections on our universal (yet often secret) experiences have inspired a social movement by reminding women that they’re not alone. 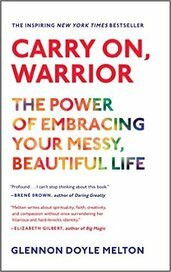 In Carry On, Warrior, she shares her personal story in moving, refreshing, and laugh-out-loud-funny new essays and some of the best-loved material from Momastery.com. Her writing invites us to believe in ourselves, to be brave and kind, to let go of the idea of perfection, and to stop making motherhood, marriage, and friendship harder by pretending they’re not hard. In this one woman’s trying to love herself and others, readers will find a wise and witty friend who shows that we can build better lives in our hearts, homes, and communities. ​Check out the latest from Liz Gilbert...easy to read and chock full of lovely ideas! ​The latest from the amazing Brene Brown, also see her Ted Talk on Vulnerability and Shame - actually, anything that she has to say! Backed with scientific research her views are fascinating! Finding Your Way in a Wild New World reveals a remarkable path to the most important discovery you can make: the knowledge of what you should be doing with your one wild and precious life. It’s the thing that so fulfills you that, if you knew what it was, you’d run straight toward it through brambles and fire. Martha guides you to find out how you got to where you are now and what you should do next, with clear instructions on tapping into the deep, wordless knowledge you carry in your body and soul. This book is about following your path, creating a life of abundance and joy, and doing your part to repair the world. Through telling his own story, along with those of other modern-day entrepreneurial heroes, David M. Howitt shares the principles behind his and others’ successes in eleven real-world lessons on how we can apply sim­ple principles that help us weave business into our spiritual narratives and pour our souls into our professions. By uniting artistry and analytics and integrating intuition with intel­lect, we positively affect the way we live and the world around us. Through the activation of creative principles, living authentically, and absorbing new experiences, we evolve from the radical integration of so-called disparate worlds. We birth a new reality and build a road map for our future. You Know Your Way Home, is a true story about a woman with 5 husbands, secretly chasing killers and missing people, until she comes to a 3 way collision with a brash mystery man, an abrupt therapist in a padded room and a revered Lakota medicine man. Local author/psychic and Wild Women speaker Suzanne Jauchius shares her fascinating life story in this book. ~ This book prompted the very first Wild Women Party in October of ’09. Nothing but sweet gratitude to my friend, Dara Charlton for gifting this book to me (Della speaking). The author Sark is simply real and everyone of us can relate to her raw truths about life experiences. ~ Treat yourself to this sweet, delicious book by our very own Della Rae. Chock full of beautiful thoughts you can use NOW. Click here or email Della to get a copy of your own!